A local photographer took this shot at this past cars and coffee. Going through his Instagram he photographs a lot of high end exotics and other expensive cars. 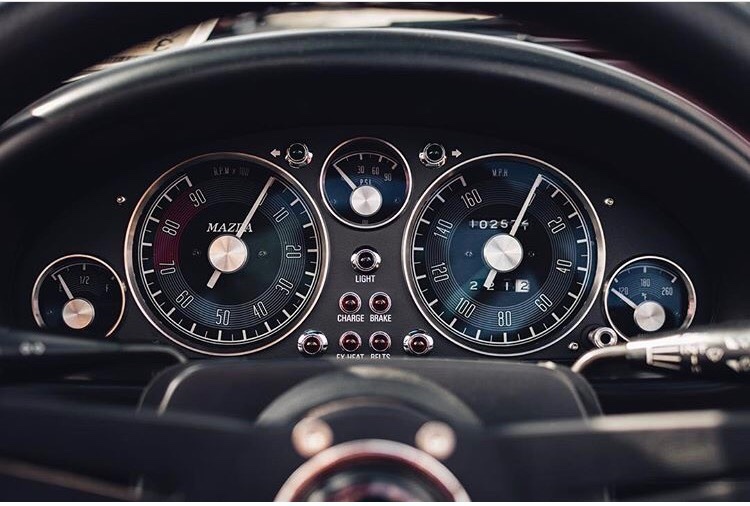 Im honored he took a second to photograph my gauge cluster and post it with nice comments. That is indeed a great photo. This exact combination is on my to buy list. Ive been slacking on the Miata. Summers at work are very busy and Ive been trying to enjoy spare time with my family. Also have been enjoying my little truck. Car has been down for a few weeks now. A few nights after work Ive been in the garage slowly getting the Megasquirt installed but have been at a roadblock with the wideband. I really really dislike wiring. So much that the install was waiting for some help from someone more experienced with wiring/soldering. The install of the MS was quite simple. Greg at TheCarPassionChannel has superb tutorial videos that Ive studied and even taken notes. Even the IAT wiring wasnt too terrible although I wish my kit came pre-assembled but it was simple enough to figure out. 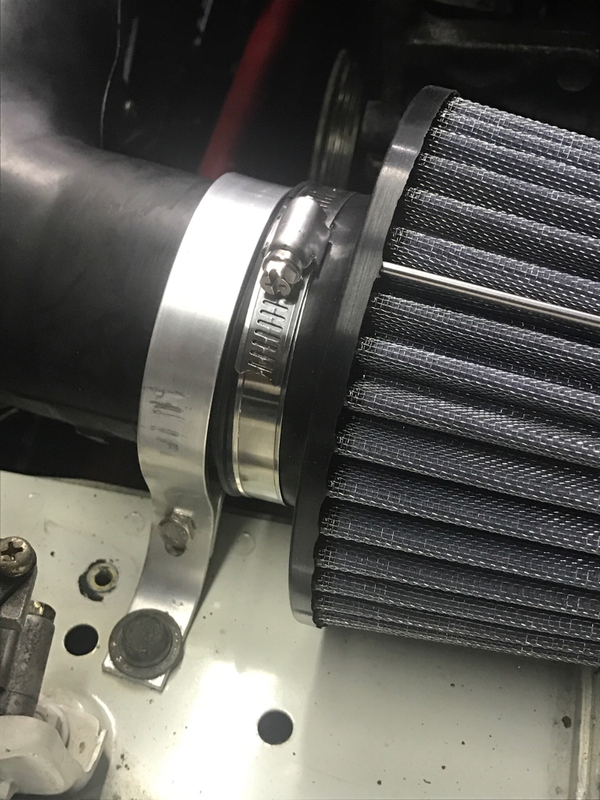 Will need to make a bracket to support the air filter now that the AFM is gone. Haven't taken any photos of the progress because it was always not done/not worth sharing. 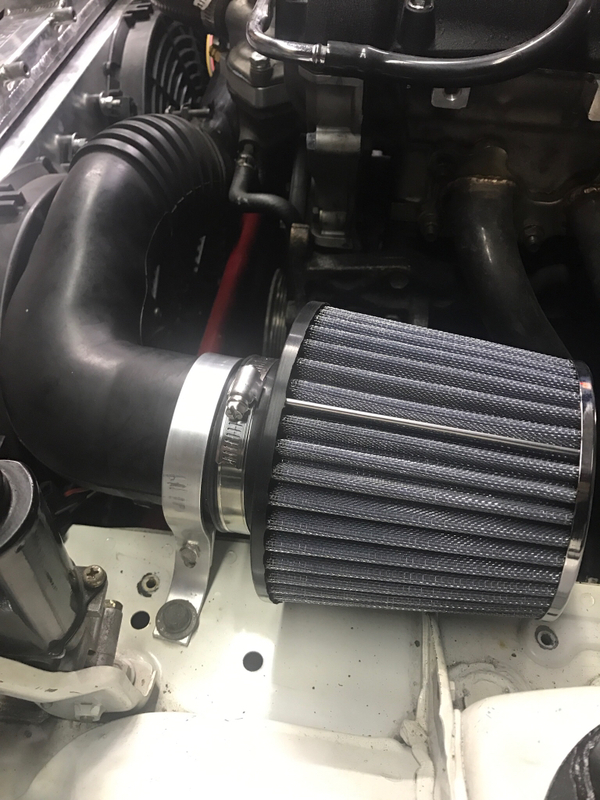 A fellow Miata-er helped out in a huge way today to get the Aem Uego wideband wired up and installed. Wires shrink wrapped, loom wrapped, routed and ziptied nicely. And after a couple hours....the car starts!!! It idles nicely. Timing looks good. AFRs show its running rich. Will need to figure out all the ins and out of Ms and tuning. Ran out of time today to drive it as I had seats and steering wheel out of it. Really hope to to get it out on the street and start auto-tuning and logging this week. I installed the wideband in the glovebox. It will change location when I figure out a spot for it in the tombstone area. 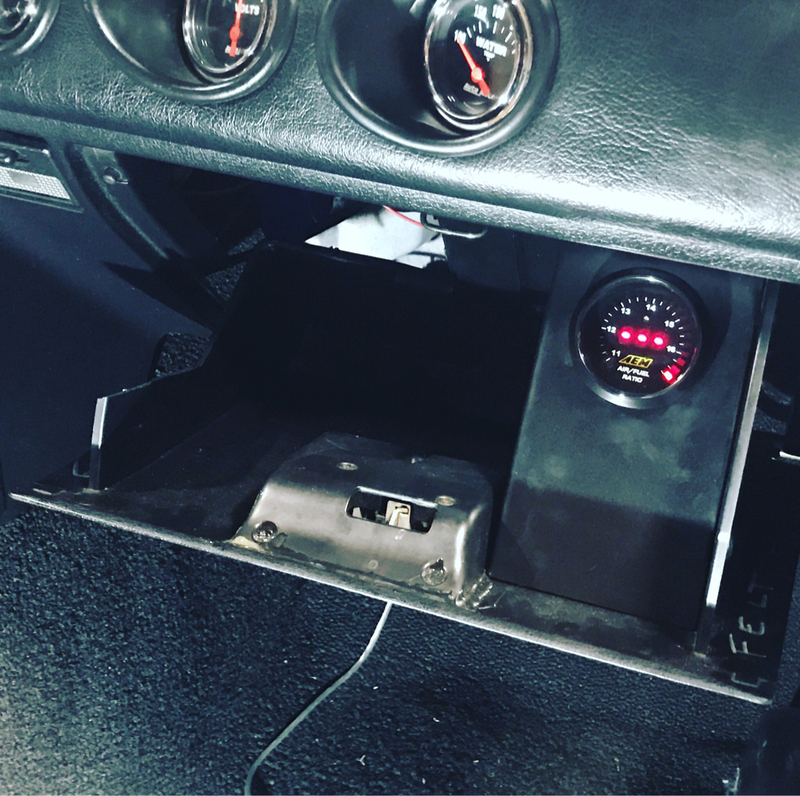 Voltmeter will most likely go to glovebox and Boost will go in the gauge cups. So car is running and driving on Megasquirt and the downloadable base map. That was my goal. Does need a bit of fidgeting to get things 100% between car and MS, but the base map from MS is amazing. Car seems to go through the gears smoother, with more power. Props to whoever made that base map. The way this car is right now is the most fun a Miata has ever been. Ever. Even with my old turbo car. Love. 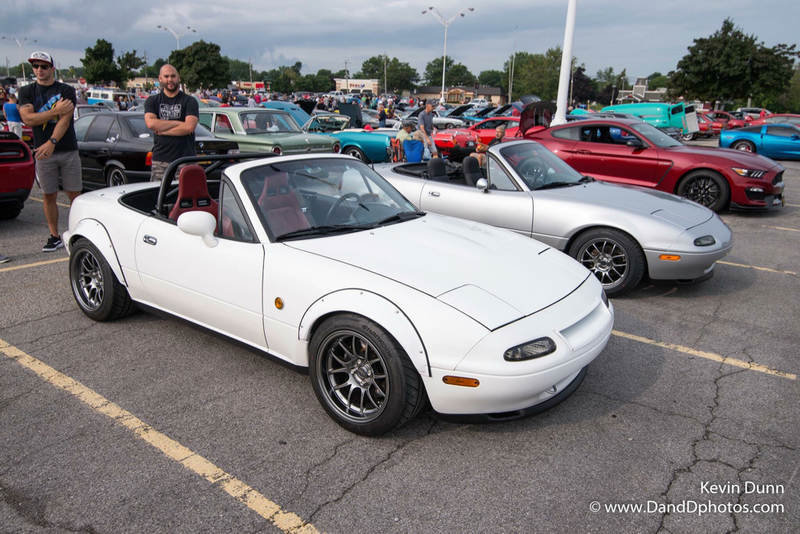 Here is a photo from the recent Cars and Coffee Buffalo. The super clean silver 92 next to my car is owned by a friend of mine who helped with the Wideband install and some other installs. 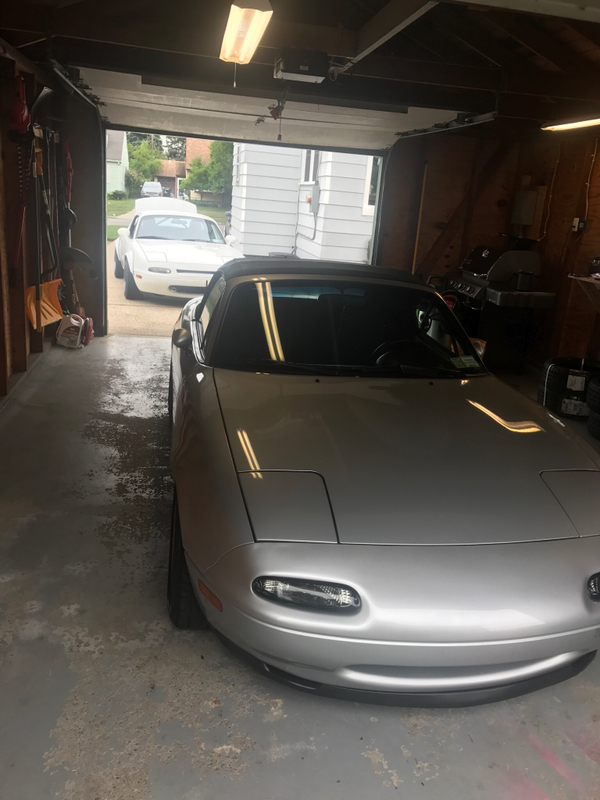 Hes owned 3 miatas now, his previous car he bought from my father. He is a genius and made up a simple but effective bracket for the new air filter. He bent that piece of aluminum into a perfect size and shape circle by hand, first try. Incredible. One day Ill spray it black. Photo from that wrenching day. So happy with the progress Ive made on the car this summer. 99% sure I did everything I set out to do. Only a couple minor things to adjust before the end of the season. Only thing left to install that I have laying around is the SuperMiata coolant reroute. Holding off on it because I may need a better hose (ie Cobalt(Moss) reroute hose) due to where I put my IAT sensor. But maybe not once I go turbo. Water temps haven't gotten above 190 so Im not too worried about super-efficient coolant with stock 1.6. The car burns oil. Im guessing valve stem seals. I have valve stem seals waiting to go in, but I think the plan is to pull the motor this winter to do the seals, a bunch of other seals, coolant reroute and a clutch. That way I can take my time. Do a lot of cleaning and prepping for hopefully a turbo. Hopefully. We still have to meet for a Cherry Hill Cars and Coffee sometime soon. I finally got mine out of the garage and will slowly be cleaning up the small details. That's a far drive for Cars and Coffee haha Let me get a more comfy long-drive seat installed first. Excited to see your car progress! I think the distance is the same for me. We should try to do it before the white stuff hits. Sorry for the lack of updates. After the Megasquirt was installed, I used the rest of the summer to just drive the car and enjoy it when I could. At the last Cars and Cofee I attended, a local photographer approached me about doing a photoshoot of the Miata for his own practice. I agreed. We set a date. Met at a nearby abandoned trucking spot he had found. Here are the photos he took. Yeah, those seats look so much better in your car than they ever did in mine. Love the way it looks. Last edited by tsingson; 11-05-2018 at 10:56 AM. I think white cars with red interior are the best look. Over the summer I picked up a GarageStar seat rail "blemished" for cheap, so I will be picking up a race bucket seat of some kind over the winter. I like your car, very clean! Can I ask you about the wheel tires / arches setup? I suppose the fenders are Carbonmiata ones, right? They are 949Racing 15*9 ET12 Exocet 6UL's in Nickel with 10mm Miatacage Spacer, 225/45 RS4 and Carbonmiata Flares as far as I know. See below. He got it it spot on. Sorry, havent been here much to check on this. Winter is slow. Damn.better than i could have put it haha thanks!